The dominant evolutionary theory of physical attraction posits that attractiveness reflects physiological health, and attraction is a mechanism for identifying a healthy mate. Previous studies have found that perceptions of the healthiest body mass index (weight scaled for height; BMI) for women are close to healthy BMI guidelines, while the most attractive BMI is significantly lower, possibly pointing to an influence of sociocultural factors in determining attractive BMI. However, less is known about ideal body size for men. Further, research has not addressed the role of body fat and muscle, which have distinct relationships with health and are conflated in BMI, in determining perceived health and attractiveness. 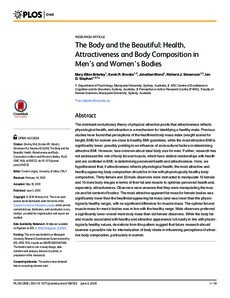 Here, we hypothesised that, if attractiveness reflects physiological health, the most attractive and healthy appearing body composition should be in line with physiologically healthy body composition. Thirty female and 33 male observers were instructed to manipulate 15 female and 15 male body images in terms of their fat and muscle to optimise perceived health and, separately, attractiveness. Observers were unaware that they were manipulating the muscle and fat content of bodies. The most attractive apparent fat mass for female bodies was significantly lower than the healthiest appearing fat mass (and was lower than the physiologically healthy range), with no significant difference for muscle mass. The optimal fat and muscle mass for men’s bodies was in line with the healthy range. Male observers preferred a significantly lower overall male body mass than did female observers. While the body fat and muscle associated with healthy and attractive appearance is broadly in line with physiologically healthy values, deviations from this pattern suggest that future research should examine a possible role for internalization of body ideals in influencing perceptions of attractive body composition, particularly in women.